On December 4, when you were doing whatever you were doing, a gamer who goes by the name of Artio was apparently chartering a plane to fly her to a remote town in Alaska. Why? So she could make a particularly powerful move in the video game Ingress. According to an account by another Ingress player—one that's backed up by photos of the feat—Artio was trying to break a blockade set up by rival players that stretched down the west coast to southern California. Ingress is played with mobile phones. Players claim spots of land all around the world and try to connect them. In Alaska, Artio was going to try to win one back for her team. To do this, she had to fly to the town of Iliamna, make a connection and break the link. She found a pilot who would take her, according to the account. They buzzed into town and then, frustratingly, Artio struggled to get the signal she needed. The ice was refreezing on the runway which could possibly prevent them from taking off. Then it happened - her GPS had a lock and she had a data connection. Shear moments remained. Armed with a Jarvis virus she deployed it not wanting to waste time with taking it down using XMPs and risk the Resistance recharging it - or worse, losing GPS again. The scanner flashed and before her frozen face, the portal turned green - the links were down. The mission was a great success from an Ingress standpoint. Now the plane had to successfully take off. The Pilot said, "If we don't leave soon, we're not going to be able to. I'm not 100% sure we'll make it off the runway now, but we'll try". With almost no time remaining in their weather window they were able to take off. That's how you play Ingress, a video game that's sort of from Google and that I've been learning about, as players do this kind of wild stuff, ever since I met its creator at Google's New York offices earlier this year. It was at the Google offices that I met a man named John Hanke. A former state department official and a long time computer guy, Hanke had started a company that created a thing that Google bought several years ago and re-named Google Earth. Hanke directed Google Earth for a while. Now he runs a company inside Google called Niantic Labs—it's a start-up within a mega-company, which apparently is an option in business. Niantic is named after a ship that is partially buried in San Francisco. It's an odd and interesting operation that's made an odd and interesting video game called Ingress. I guess this means that in a roundabout way, Google has made a video game, which is unusual if you don't count all those games hidden in Google Doodles. Technically, Niantic made the game. And what a game it is. People meet in cities to play it. They go into jungles to play it. People in enemy countries play it. They climb mountains to play it. Hanke: "We had a lot of discussions about that with Google Earth. Sergei's like, 'We should make a game out of this. You should be able to blow things up and drive around.'" Ingress is a mobile game that splits all of its players into two factions and challenges them to claim locations anywhere on Earth—for real, outside—and to connect those points to turn them into massive triangles. The game mixes the real world with science fiction. The player factions, the Enlightened and the Resistance, are more or less at war. More recently, they've been working at cross purposes to unite the shards of a broken man named Jarvis, ferrying these digital treasures around the world, to either unite them for one faction in San Francisco on December 14, if the other faction can't unite the majority of them on that same day in Buenos Aires. This storyline is called #13MAGNUS. You can catch updates about it in the Ingress Report, a web show that moves the plot along and highlights player exploits. To get a feel for what people do with Ingress, check out the Ingress Report episode that shows how players in Cyprus, Israel and Lebanon worked together to create a massive control field over part of the Middle East. Or watch the one about players climbing to the highest mountain in Taiwan to claim a spot. It's enough to make me, an iPhone owner, a bit jealous! Ingress builds on a lot of stuff that's come before it. It's a little like Majestic, the experimental alternate reality game from EA that came out at the turn of the century and would embroil real-world players in a fictional adventure through phone calls, faxes and the like. It's also tied to the many location-based games before it that have let players with cell phones turn the real world into mazes and battlefields. Ingress is also built upon Google Earth itself, a fact that led Hanke to sharing this fun nugget with me about some ideas he had bounced around with Google co-founder Sergey Brin. "I see a map and I think, 'Oh, there should be a game to this.' We had a lot of discussions about that with Google Earth. Sergei's like, 'We should make a game out of this. You should be able to blow things up and drive around.' So it was always there in the background, but then smartphones happened and you had GPS and all these sensors. Why not change the world into a game? That seems innovative. That hasn't really been done in a good way." 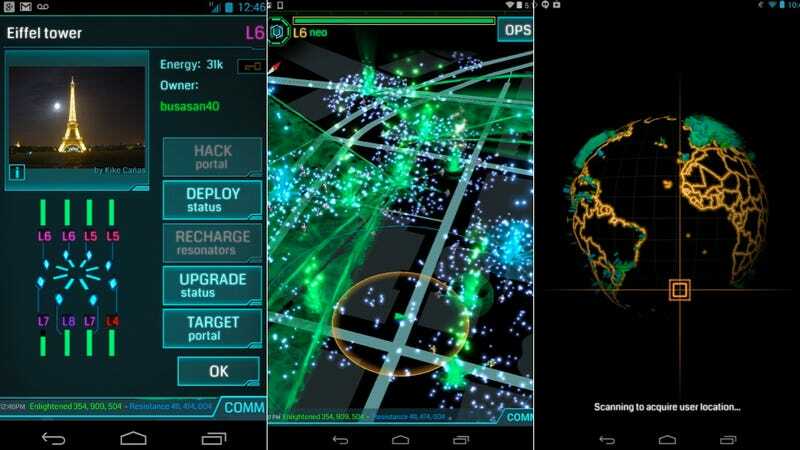 Hanke's team released Ingress last December on Android. It's been in beta, though it'll exit that status on December 14. At that point, anyone can join and play, without the need to request an invitation. There's some reason to try to start playing now, since there's still one more #13MAGNUS-related meet-up/event in Phoenix, Arizona and Rome on Saturday, December 7. Hanke likes the idea, as he puts it, of "people using Ingress as kind of an excuse to go out and do cool stuff." Hanke is a longtime sci-fi fan and a former game programmer himself. He likes games, but he's been anxious about how sedentary most mobile games are. He's proud that Ingress players, at least, are getting out in the world, discovering game "portals" in historical sites and cultural institutions, and planting nodes in all sorts of exotic spots. "The real opportunity to me seemed to be to reinvent the concept of a game on phones to make it about movement and exploration and require one to do that as part of the game," he said. "And then, yeah, it gets to be a solution to this problem. Instead of games incenting you to sit still, they can incent you to move around and walk." He likes the idea, as he puts it, of "people using Ingress as kind of an excuse to go out and do cool stuff." Beyond the December 14 wrap-up to the Jarvis saga and Ingress' first year, Niantic will release an iOS version so even more people can play. Hanke is coy about whether Ingress will also come to Google Glass, his parent company's famous augmented reality specs, but it seems inevitable. Niantic's other project, the landmark-spotting Field Trip, was recently released for Glass. Hanke simply points out that Niantic isn't just about making apps that use Google Earth map data but to "anticipate some of the opportunities in wearable computing." Niantic also plans to release APIs (programming standards) that will let other people build their own massively-multiplayer location-based experiences all on top of Google's map data. "We're trying to do something innovative with gaming," Hanke said. Sounds fun.